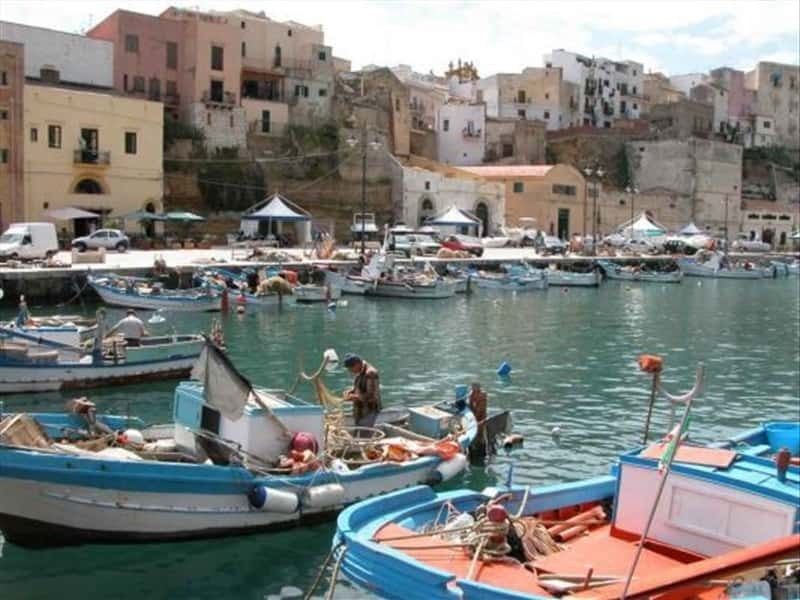 Situated in the Eastern part of Sicily, also known as the "city between two seas", Trapani was, in its origins, founded by the Sicani; In VIII century b.C. with the Phoenicians the city became an important emporium and port for the Mediterranean trade routes. The city was conquered by the Greeks that named the city Drepanon (scythe), then by the Carthaginians, the Romans and the Byzantines. An new economic and cultural growth was registered during the IX century A.D., when the Arabs conquered the whole island and named the city Tarabanis, and then by the Normans that proclaimed its royalty. The city prospered with jewellers, coral craftsmen and naval commercial activities. The Basilica of Maria Santissima Annunziata, built in '300 and enlarged in '700, preserves a precious marble statue of the Madonna of Trapani, venerated throughout the whole Mediterranean. The façade is decorated by a Gothic-chiaramontano portal and a large rose window. The Cathedral of San Lorenzo distinguishes itself for the Baroque façade ('700) with wonderful arches; and inside it preserves a famous painting of the Crucifixion of Christ of the artist Van Dyck. The Tower of Ligny, built in 1671 to defend the city, by the viceroy don Claudio La Moraldo, prince of Ligny and today hosts the Prehistoric and Archaeological Sea Museum, where it is possible to admire amphoras, trunks and other exhibits recuperated from sunk ships in the area. The Castle della Colombaia or Castle di Mare, is situated on a small island in a strategic defense location over the port of Trapani. One of the best examples of military architecture, historical sources reveal that there was a fortification here already in 260 b.C., probably built by Amilcare Barca, Carthaginian general, father of the more famous Hannibal. Not to miss: Palazzo della Giudecca ('500), Palazzo Cavaretta, with an important Baroque façade, Palazzo Lucatelli, the old hospital of the city, Palazzo della Vicaria, the old prison, Palazzo Riccio di Morana, seat of the Provincial Council, Palazzo delle Poste, in Liberty style, the Fountain di Saturno ('300), in the homonym square and the Fountain del Tritone (1951), artwork of Domenico Li Muli. This town web page has been visited 43,036 times.